This post has been sponsored by The National Pork Board. All opinions are my own. It’s the middle of summer, and I must say that I’m loving the warm weather and have been spending as much time as possible soaking it up outdoors. I’m usually just hanging on the patio while my kids are playing with their toys in the backyard and these have been the best moments. Since I’ve been spending so much time in our backyard, I tend to grill a lot of our meals. I love grilling pork ribs, chops and loin, which is no surprise as according to the new National Pork Board study, pork ribs and chops are the two cuts that are most favored by African Americans and Hispanics over all other protein cuts. I’m a huge fan of both cuts as well as pork loin because they are full of flavor, convenient to cook or grill and are easily accessible – I can grab a slab of ribs at just about any grocery store! 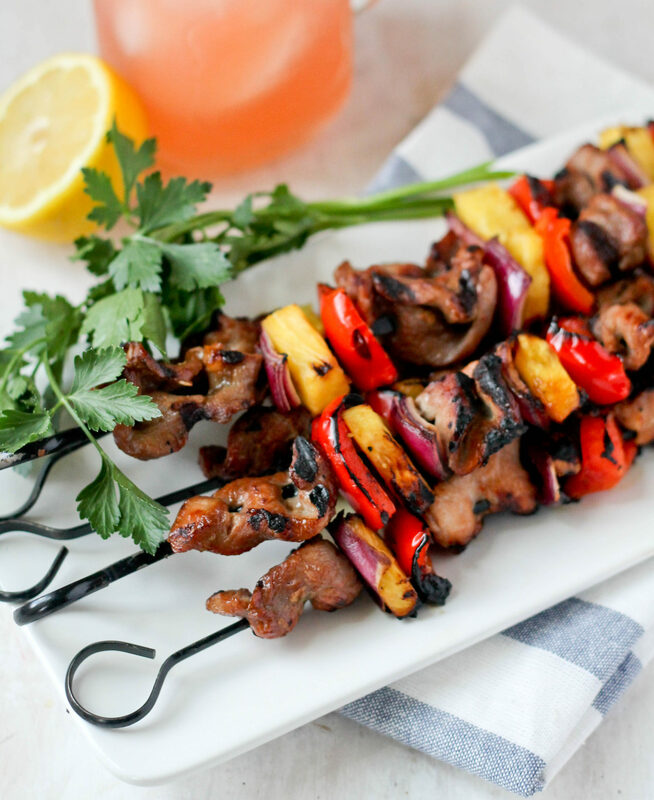 One of my favorite ways to prepare pork loin is by making these amazing Grilled Asian Pork and Pineapple Skewers. A quick marinade is all that’s needed, especially when using pork loin as I’ve done to make my skewers. The pork skewers are then grilled and cooked for 10 minutes given the pork is thinly sliced. 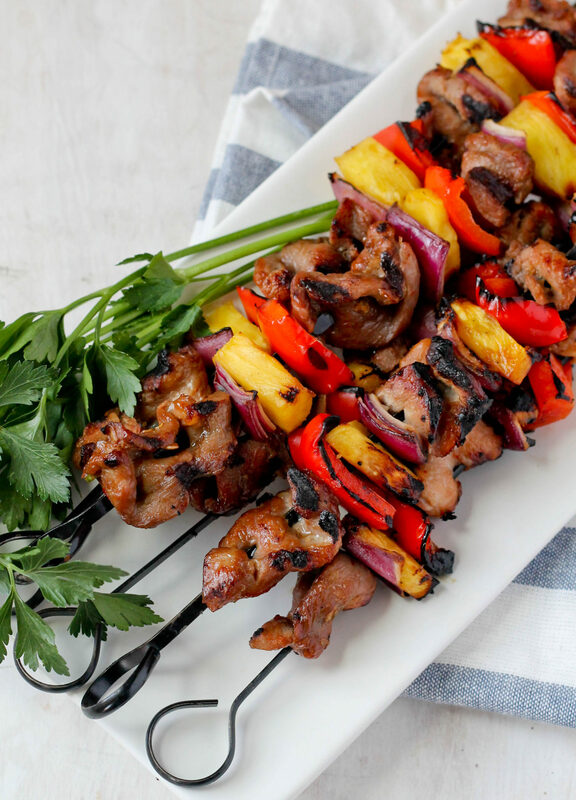 The pork skewers are the perfect balance between sweet and savory- the pork loin has tons of flavor from the soy sauce, garlic and ginger while the sweet peppers, pineapple and red onion become even sweeter when grilled. Pork loin is a great centerpiece for any dinner and it’s also great when grilled. I love the fact that pork is healthy, lean and easy to prepare – I marinated the strips of pork loin in a marinade made with soy sauce, garlic, ginger, sesame oil, red pepper flakes and brown sugar, and put it in the fridge for just an hour. I then grilled it up, and it took about 10 minutes to cook. 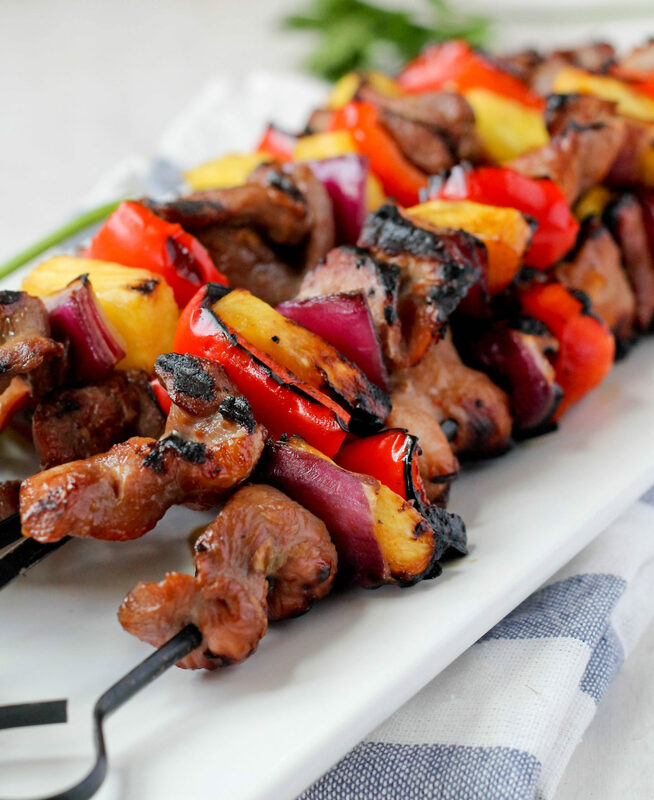 The skewers resulted filled with flavor, very tender and juicy. In the past, I’ve even grilled a whole pork loin, which you can see in my Jerk Pork Slider recipe. It was amazing! Pork is such a flavorful protein and it doesn’t require much seasoning. Another benefit of grilling is that there is no added fat and you can prepare a healthy meal by choosing leaner cuts of meat such as pork chops, which comes in different varieties such as rib eye pork chop and porterhouse chop. There are many ways you can enjoy pork’s delicious flavor and nutritional benefits. For recipe ideas and more information, please visit ​PorkEsSabor.com​ and ​follow​ along on social media at @PorkEsSabor on ​Facebook​, ​Twitter​, and ​Instagram​. ​ Join​ the conversation using #PorkEsSabor. Prepare the marinade by mixing soy sauce, sesame oil, brown sugar, red pepper flakes, garlic, ginger and scallion in a bowl. Place the pork loin strips in a bowl and pour marinade over. Mix well making sure to coat all the pieces and place in the fridge for 1 hour to marinate. 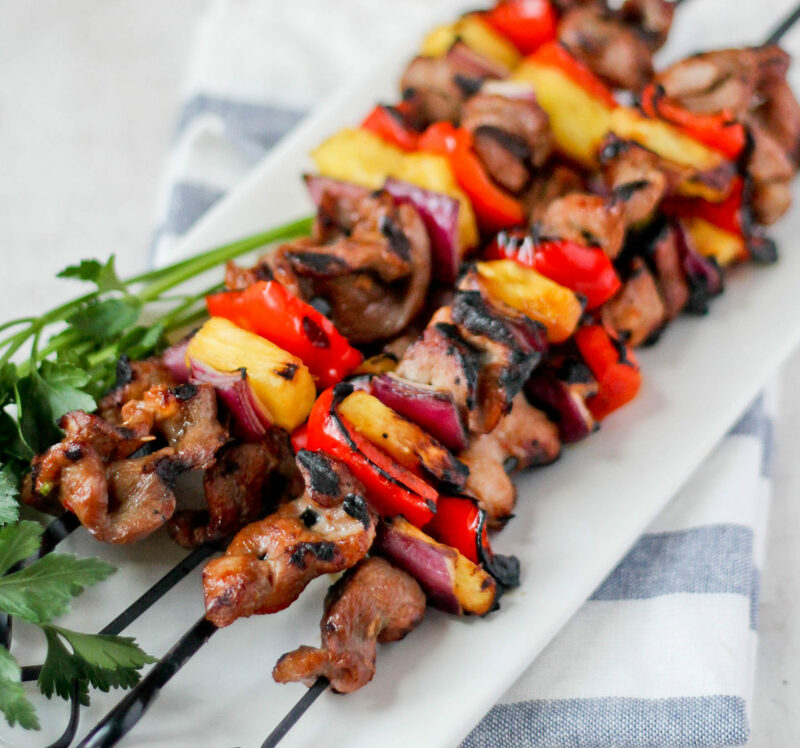 Prepare the skewers by threading the pork on the skewers by alternating between the pork, pineapple, red pepper and red onions. If using wood skewers, be sure to soak in water for 1 hour before using. Heat the grill to 350-400 degrees, then cook the skewers turning once. This will cook quickly, about 10 minutes, given the strips are thinly sliced.